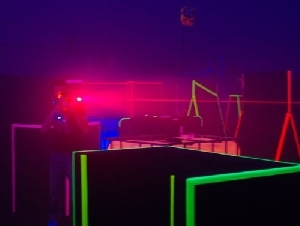 Laser tag is a team or free-for-all game where players score points by tagging one another with infrared laser beams. At the Lazer Factory, children can enjoy a sophisticated, interactive laser tag game played in a futuristic arena complete with glow in the dark graphics, cool hiding spots, music and a rotating disco ball. Black lighting, stunning graphics and special effects create a fun and exciting atmosphere. An eerie glow emanates from the front and back of the high tech fiber optic vests. Suddenly, laser beams (totally safe) pierce the darkness creating a dazzling display of lights. Combatants hide behind protective cover and maneuver through an interconnecting maze. Games are 10 or 5 minutes in length and can accommodate up to 10-14 children at one time. Lazer tag is a great group activity making it the perfect activity for birthday parties.